Fisheries management refers to a governmental system of management for the protection and sustainable development of biological resources. Currently, fisheries management focuses more on limiting catch rather than proactive marine resource recovery measures, such as aquaculture. Compared to agricultural studies and technology, marine science and technology are still at an early stage of development and the development of fisheries management will require further research and public support. Effective fisheries management can contribute to the sustainable development of marine resources. The control of fisheries production has been exercised in many places around the world for hundreds of years. For example, the Māori people, residents of New Zealand for about the last 700 years, had strict rules in their traditional fishing activities about not taking more than could be eaten and throwing back the first fish caught (as an offering to Tangaroa, god of the sea). Another longstanding example is the North Norwegian fishery off the Lofoten islands, where a law has existed for more than 200 years to control fishing activity; in this case, the increase in the number of fishermen caused problems that necessitated management. To avoid gear collision, gillnetters and longliners are separated and not allowed to fish in the same grounds south of Lofoten. Similar kinds of fisheries management have been practiced in many places of the world, which often involve aspects such as restrictions on fishing seasons, location, and species. Fishery management in the pre-modern era has traditionally been organized by local fishing communities. Their practices have often been connected with religious beliefs, rituals, and customs. These forms of community based fishery management, however, encountered various challenges in the modern era as each community, and their marine resources, became a part of national or global economy and fisheries were managed primarily from the perspective of economic growth, with little to no attention given to ecological sustainability. Governmental resource protection-based fisheries management is a relatively new idea, first developed for the North European fisheries after the first Overfishing Conference held in London in 1936. In 1957 the British fisheries researchers, Ray Beverton and Sidney Holt, published a seminal work on North Sea commercial species fisheries dynamics. The work was later (in the 1960s) used as a theoretical platform for the new management schemes set up in North European countries. After some years away from the field of fisheries management, Ray Beverton reassessed his earlier work and in a paper given at the first World Fisheries Congress in Athens in 1992, he criticized some of the concepts that he had earlier laid out in "The Dynamics of Exploited Fish Populations" and expressed concern at the way his and Sydney Holt's work has been misinterpreted and misused by so many fishery biologists and managers during the previous 30 years. Nevertheless, the institutional foundation for modern fishery management had been laid. International agreements are required in order to regulate fisheries taking place in areas outside national control. The desire for agreement on this and other maritime issues led to the three conferences on the Law of the Sea, and ultimately to the treaty known as the United Nations Convention on the Law of the Sea (UNCLOS). Concepts such as exclusive economic zones (EEZ, extending 200 nautical miles (370 km) from the nation's coasts; if a continental shelf continues, EEZ is extended beyond 200 nautical miles) allocate certain sovereign rights and responsibilities for resource management to individual countries. There are a number of situations that need additional intergovernmental coordination. For example, in the Mediterranean Sea and other relatively narrow bodies of water, EEZ of 200 nautical miles are irrelevant, yet there are international waters beyond the 12-nautical-mile (22 km) line of coastal sovereignty. International agreements, therefore, must be worked out for fishery management in the international waters of the narrow sea. There are also issues with straddling fish stocks. Straddling stocks are fish stocks that migrate through, or occur in, more than one economic exclusion zone. Here sovereign responsibility must be worked out in collaboration with neighbouring coastal states and fishing entities. Usually this is done through the medium of an intergovernmental regional organisation set up for the purpose of coordinating the management of that stock. UNCLOS does not prescribe precisely how fisheries that occur solely in international waters should be managed, and there are several new fisheries (such as high seas bottom trawling fisheries) that are not yet subject to international agreement across their entire range. Both of these issues came to a head within the United Nations in 2004 and the UN General Assembly issued a resolution on Fisheries in November 2004 which set the scene for the further development of international fisheries management law. Fisheries objectives need to be expressed in concrete management rules. In most countries the management rules today should be based on the internationally agreed, albeit non-binding, standard Code of Conduct for Responsible Fisheries, agreed at an FAO (the UN Food and Agriculture Organization) session in 1995. The precautionary approach prescribed here is also implemented in concrete management rules as minimum spawning biomass, maximum fishing mortality rates, and so on. The top row represents indirect methods while the bottom row represents direct methods of regulation. vessel monitoring systems, patrol vessels and aircraft, and observers aboard fishing vessels are examples of direct regulatory methods. The left column shows input controls and the right column output controls. Many countries have set up Ministries and Government Departments, named "Ministry of Fisheries" or similar, controlling aspects of fisheries within their exclusive economic zones. According to a 2008 UN report, the world's fishing fleets are losing $50 billion USD each year through depleted stocks and poor fisheries management. The report, produced jointly by the World Bank and the UN Food and Agriculture Organization (FAO), asserts that half the world's fishing fleet could be scrapped with no change in catch. In addition, the biomass of global fish stocks have been allowed to run down to the point where it is no longer possible to catch the amount of fish that could be caught. Traditional management practices aim to reduce the number of old, slow-growing fish, leaving more room and resources for younger, faster-growing fish. Most marine fish produce huge numbers of eggs and larvae, and the assumption has been that the younger spawners will produce plenty of viable larvae. However, recent (2005) research on rockfish shows that large, elderly females are far more important than younger fish in maintaining productive fisheries. The larvae produced by these older maternal fish grow faster, survive starvation better, and are much more likely to survive than the offspring of younger fish. Failure to account for the role of older fish in maintaining healthy populations may help explain recent collapses of some major US West Coast fisheries. Recovery of some stocks is expected to take decades. One way to prevent such collapses may be to establish marine reserves, where fishing is not allowed and fish populations age naturally. 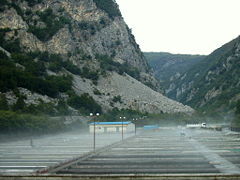 Large Aquaculture facility in Martin Bord, West Bosnia. The traditional approach to fisheries science and management has been to focus on a single species. This can be contrasted with the ecosystem-based approach. Ecosystem-based fishery concepts have existed for some years and have been implemented in some regions. In a recent (2007) effort to "stimulate much needed discussion" and "clarify the essential components" of ecosystem-based fisheries science, a group of scientists have offered the following "ten commandments for ecosystem-based fisheries scientists"
Aquaculture, including artificial hatching and fish farming, can be an important part of fishery management. However, aquaculture is still in its early stages of development. Complete life cycle farming, from hatching to spawning, is successful only for a few species for the mechanisms and conditions necessary for the vast majority of species are still unknown. The development of aquaculture will require further research and public support. According to fisheries scientist Milo Adkison (2007), the primary limitation in fisheries management is the absence of quality data. Fisheries management decisions are often based on population models, but the models require quality data to be effective. More simple models for analysis and better quality of data can help scientists and fishery managers make more effective decisions in fishery management. ↑ Beverton and Holt, 1957. ↑ Richard Black, Fisheries waste costs billions, BBC News. Retrieved November 18, 2008. ↑ Jessica Brown, New Science Sheds Light on Rebuilding Fisheries, SeaWeb. Retrieved November 18, 2008. ↑ Science Daily, Marine Ecologists To Help Rebuild Decreasing Fish Stocks. Retrieved November 18, 2008. ↑ Oregon State University, "Ten commandments for ecosystem-based fisheries scientists." Retrieved November 18, 2008. ↑ University of Alaska Fairbanks, Adkison advocates increased fisheries data gathering. Retrieved November 18, 2008. Beverton, R.J.H., and S.J. Holt. 1957. On the Dynamics of Exploited Fish Populations. Chapman and Hall, 2004. ISBN 978-1930665941. Beverton, R.J.H. 1992. Session 4: The state of fisheries science The State of the World's Fisheries Resources: Proceedings of the World Fisheries Congress, Plenary Sessions, Athens, 1992. Retrieved November 18, 2008. Black, Richard. Fisheries waste costs billions. BBC News. Retrieved November 18, 2008. Brown, Jessica. New Science Sheds Light on Rebuilding Fisheries. SeaWeb. Retrieved November 18, 2008. Francis R.C., M.A. Hixon, M.E. Clarke, S.A. Murawski, and S. Ralston. Ten Commandments for Ecosystem-based Fisheries Scientists. Proceedings of Coastal Zone 07, Portland, Oregon, July 22 – 26, 2007. Retrieved November 18, 2008. Morgan, Gary, Derek Staples, and Simon Funge-Smith. 2007. Fishing capacity management and illegal, unreported and unregulated fishing in Asia. FAO RAP Publication, 2007. ISBN 978-92-5-005669-2. Retrieved November 18, 2008. Oregon State University. Ten commandments for ecosystem-based fisheries scientists. Retrieved November 18, 2008. Science Daily. Marine Ecologists To Help Rebuild Decreasing Fish Stocks. Retrieved November 18, 2008. Townsend, R, Ross Shotton, and H. Uchida. 2008. Case studies in fisheries self-governance. FAO. Retrieved November 18, 2008. UNEP. 2007. Procedure for Establishing a Regional System of Fisheries Refugia in the South China Sea and Gulf of Thailand in the context of the UNEP/GEF project entitled: “Reversing Environmental Degradation Trends in the South China Sea and Gulf of Thailand.” South China Sea Knowledge Document No. 4. UNEP/GEF/SCS/Inf.4. Retrieved November 18, 2008. Voigtlander, C. W. (ed.). 1994. The State of the World's Fisheries Resources. Proceedings of the World Fisheries Congress (Athens, 1992), Plenary Sessions. Oxford: IBH Publishing Co. Pvt. Ltd.
FAO: Fisheries and Aquaculture Department. 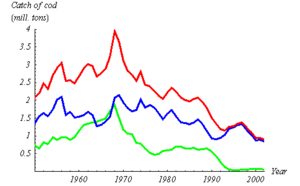 State of the World Fisheries and Aquaculture 2006.